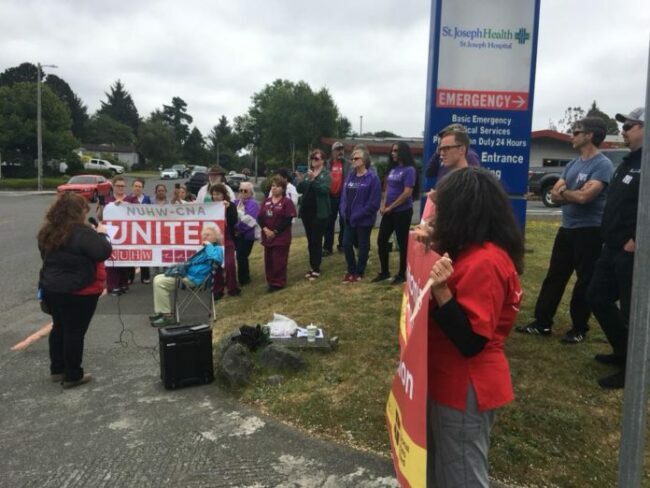 Sick of being forced to work with cleaning chemicals that make them ill, housekeepers at St. Joseph Eureka and Redwood Memorial hospitals took to the streets Monday to demand their hospitals switch cleaning solutions. The June 18 protest outside St. Joseph Eureka was covered by NBC3 and the Lost Coast Outpost. For the last two years housekeepers at both hospitals have been required to use OxyCide, a relatively new one-step cleaner, disinfectant, and deodorizer product, which they say has caused them respiratory problems, burning noses, burning eyes, rashes and severe headaches. They are not alone. Acting on a worker complaint, the National Institute for Occupational Safety and Health conducted a 2015 survey of housekeepers at a Pennsylvania hospital that used the same cleaning product, which includes the chemicals hydrogen peroxide and peroxyacetic acid. The survey found that out of 68 housekeepers who reported using the product, 29 percent complained of watery eyes, 22 percent complained of nasal problems and 15 percent complained of asthma-like symptoms. The author of the NIOSH study recommended that hospitals take measures to reduce employee exposure to OxyCide if they report respiratory, skin or eye problems. The University of Vermont Medical Center stopped using OxyCide after nurses complained, and the hospital was cited by Vermont OHSA for failing to properly assess the hazards posed by the product. 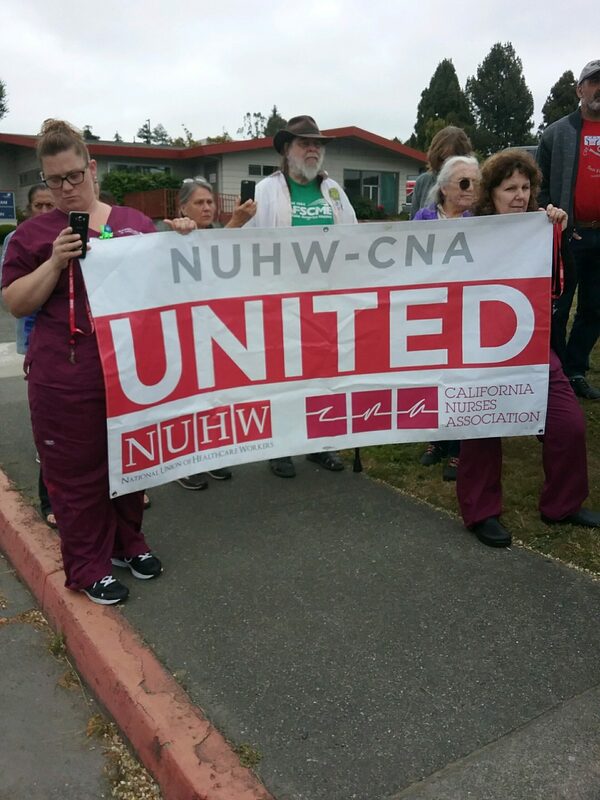 Yet, despite months of formal complaints from workers, St. Joseph, which also operates Redwood Memorial Hospital, is still refusing to address their concerns. St. Joseph’s intransigence led the housekeepers to demand that the matter go to arbitration. OxyCide is produced by the firm Ecolab. It hit the market in 2013, billed as an effective agent for killing bacteria on hospital surfaces. The housekeepers were joined Monday by supportive colleagues including nurses, local labor unions, and community members.